It’s a seven page document with getting on for thirty references to further documents, so plenty of detail. It does make mention of ‘all…abilities’ on page three, and one of the documents referenced includes a paragraph about access controls on off-road routes, but it doesn’t exactly shove the disability issues under your nose. An explicit mention of people using trikes and handcycles would create a mental image that could really define the agenda on space. Saying ‘trikes’ instead of ‘cycles’ when talking about more flexible space on trains would be soooo much more useful. And the motion passed at the 2011 AGM in Weymouth deserves a much bigger push – That CTC promote: the removal of existing physical barriers to disabled cyclists; the inclusion of disabled cyclists in the design methodology of new cycle infrastructure; the publication of information detailing where exclusion exists in cycle infrastructure. Perhaps I’m being picky, too wrapped up with the disability angle, but it just doesn’t feel like my dream. 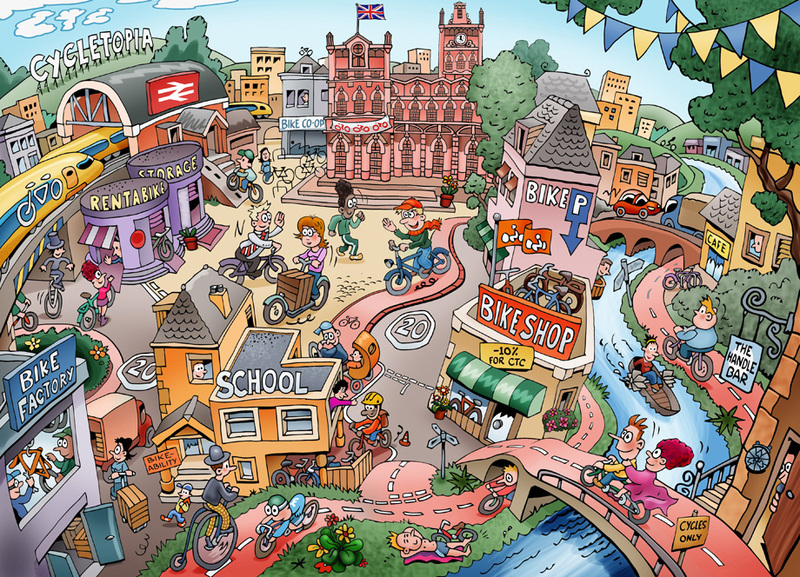 Did you spot the handcycle and the trike?